Monday will begin a new job! With that new job, I desperately need to do a bit of shopping…for work clothes. I love great, professional clothes but I’m still figuring out what works for my 25- (almost 26-) year-old lifestyle. What does a 20-something professional dress like? Here are some current favorites. Jackets. I’m learning that a good suit jacket doesn’t HAVE to be the classic look. I love a classic suit – but in the heat of the south in the summer, I just can’t do it. But I am LOVING this suit from Banana. So stylish, feminine, and light. Shirts that aren’t button downs. I’ve also had in my head that you must wear a collared, button down shirt under suit jackets. False. Look at how great these blouses are from WHBM and Banana. Dresses. I ALWAYS love dresses. And how gorgeous is this one from WHBM? 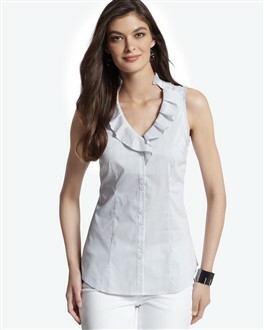 Or this one, also from WHBM? A girl can never have too many black dresses, right? All you need is a little jacket to go with it! And shoes, of course. 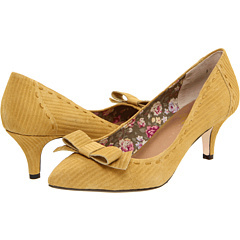 I’m sort of tired of the pointed toe – not that they aren’t comfortable, but I managed to DESTROY those pointed toes. 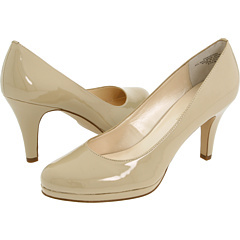 So I’m heading toward the sensible heels… I love neutrals right now, like these from Anne Klein. I ALSO love the idea of a red for winter, and maybe even a yellow to switch things up a little? I’m not good at color! And so, these are my thoughts. I plan to do a little shopping this weekend, with a focus on jackets and shoes, and maybe shells for under said jackets. Needless to say, my budget cannot buy much WHBM, so if you know great shopping places with lower prices, let me know! Clearly I’m a little tardy to the party here, but it’s tax free weekend this weekend. I think we’re having some sales at BR, so you should brave the crowds and come by! We just got in some stretch pencil skirts that I’m in love with….